Consistently rated as the most attractive part of the body by both sexes, the Glutes are also integral for lower body power generation, strength, and stability. A weak set of glutes can lead to injury, and can prevent you from hitting high weights in the squat, deadlift, lunge, or glute bridge. In this article we are going to look at how to train your glutes to the max. We will look at the best exercises there are, and describe how to perform them. The gluteals are a muscle group comprised of three muscles, these are: the gluteus maximus, gluteus medius, and gluteus minimus. There are other muscles that surround and interact with these muscles, particularly the Tensor Fascia Lata, and the IT band. You also have the quadriceps and hamstrings. Most exercises that target the glutes will also work one or two of these other muscles too. In this section we are going to separate glute exercises into compound and isolation. A compound exercise is one that works muscles at once, a bench press is a good example as it targets the chest while also working the triceps and shoulders. An isolation exercise is one that only focuses on one muscle, a bicep curl, or leg extension is a great example of this. There is very little help from any other muscles at all. So first we will look at compound exercises that work the glutes, then we will look at isolation exercises, before putting them both together to create the ultimate glute workout. There are so many leg exercises that involve the glutes, that it would be more difficult to find an exercise that didn’t work the glutes! Here are a selection of the best ones. Set yourself up in a squat rack, place a barbell on your upper back (Traps) and stand with feet shoulder width apart. Take a deep breath and squat down until your thighs are at least parallel with the ground (if you can do lower while keeping good form then do so). Pause and then drive upwards breathing out forcefully as you do. You can use either dumbbells or a barbell to perform this exercise. Stand with the weights held just in front of your legs. Pull your shoulders back and push your chest out. Bend your knees very slightly but then hold them still for the entirety of the exercise. You are now going to bow forwards, from the hip. The weights will travel down your legs, and you should feel a stretch in your hamstrings. Once you have reached the limit of the stretch you can pause and then slowly return to the start. Stand upright with both feet together, then take a large step forward. Place your front foot flat on the ground, and raise the heel of your back foot into the air so that you are on your toes. This is your starting position. Drop your back knee until it is almost touching the ground, this should leave your front thigh parallel to the ground. Push off with your front foot and return to the starting position. Repeat with your opposite foot. Get a partner to hold your ankles as you kneel on a mat (you can alternatively use the pad on a leg extension machine, or anywhere where you can lock your feet under), push your chest out and shoulders back, then push your hips forward until you are completely straight. Now, keeping your knees pushed into the mat lower your upper body down towards the floor, use your hands to break your fall. Then push your hands against the floor and push yourself back to the starting position. The slower you perform this, the better. Find a workout bench, plyometric box, or similar flat surface that you can use. Place your foot on top of the bench and your other foot flat on the floor. If either foot is not flat, then the bench is too high. Keep your hands by your sides, and chest pushed out then step up onto the bench. Stand up straight and then return the same foot back down to the ground. Repeat for 10 reps and then swap legs. Try to use as little momentum as possible, and go nice and slowly. 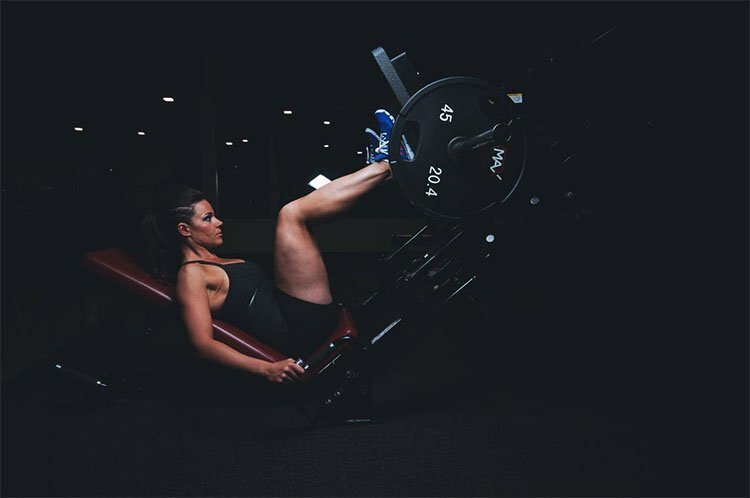 Lie on the leg press machine with your lower back flush against the seat, place your feet shoulder width apart and ensure that your knees and toes are in alignment. Push the plate away from your body until your legs are almost fully extended, pause and then lower the plate until your knees are near your chest. Pause and then drive the plate away, breathing out forcefully at the same time. Using a very light weight (just the barbell on its own), stand upright with knees slightly bent, chest out, and the barbell resting on your upper back. Pull your shoulder blades backwards, and then bow forward from the waist. Pause when you either get to near parallel to the floor, or when your hamstrings start to feel stretched, and then return to the starting position. Lie on the floor with feet flat on the ground and knees bent. Place your arms by your sides. Take a deep breath and then drive your hips forward until there is a straight line from your knees to your head. Squeeze your glutes as hard as possible while doing this. Pause, and then lower your glutes back down to the ground. 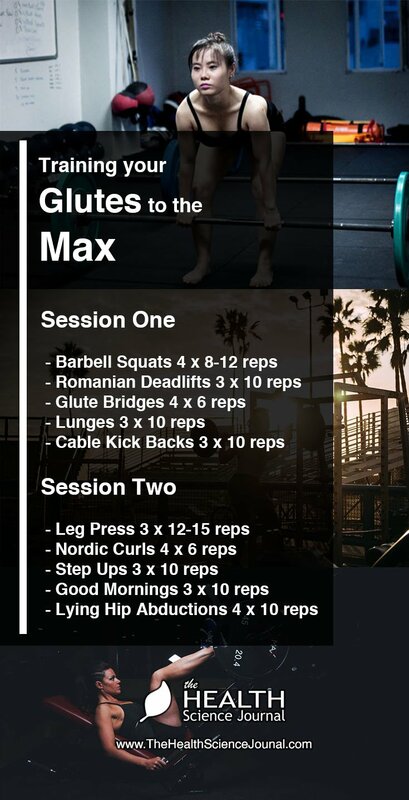 There aren’t actually too many glute isolation exercises around, but the two that we are going to look at are massively underrated. Partly because they are not well known, but partly because the people who would recognise them would think them very unfashionable. The sort of exercise you’d perform while wearing spandex and sweat bands in the 80s. For this exercise you will need a cable station and an ankle attachment, place the pulley on the bottom setting and stand facing the station (ideally holding onto a set of handles). Keeping your leg straight pull your leg backwards until you can feel the resistance on your glutes, slowly return your leg to the starting position, and repeat for 10 reps. Swap legs afterwards. This is an exercise that mostly focuses on the Gluteus Medius. Lie sideways on the floor with your hand holding your head up, and your other hand bracing against the floor. All you have to do now is raise your leg up in the air until you hit a 45 degree angle. Pause and then return it, perform 10 repetitions and then swap sides. Now that we have a list of the most effective exercises for training the glute muscles, we need to put it into a training program that’s easy for you to follow. But there are a lot of exercises here, so we are going to split it into two sessions. You could partner them with two upper body sessions to create a decent full body training program. Notes: Try to keep rest periods to 3 minutes long, this has been shown to be very effective for strength training. If you are training for fat loss then you can reduce that to 45-60 seconds, but also expect to reduce the weights used. A lot of the exercises such as the squat, lunges, glute bridges, and step ups can be performed as bodyweight or with dumbbells or barbells. You can decide for yourself which suits your needs and ability better.